The final countdown has come. Week 7 has gone and week is arriving. So much fun has happened at Cedar Brook that no one wants to go. From field trips and competitions, to sleep overs and tea parties! The theme song to a great show says "there're 104 days of summer vacation and school comes along just to end it, but the annual problem of our generation is finding a good way to spend it". I'd say that Cedar Brook Day Camp solved that problem and the campers found a great way to spend their summer vacation. 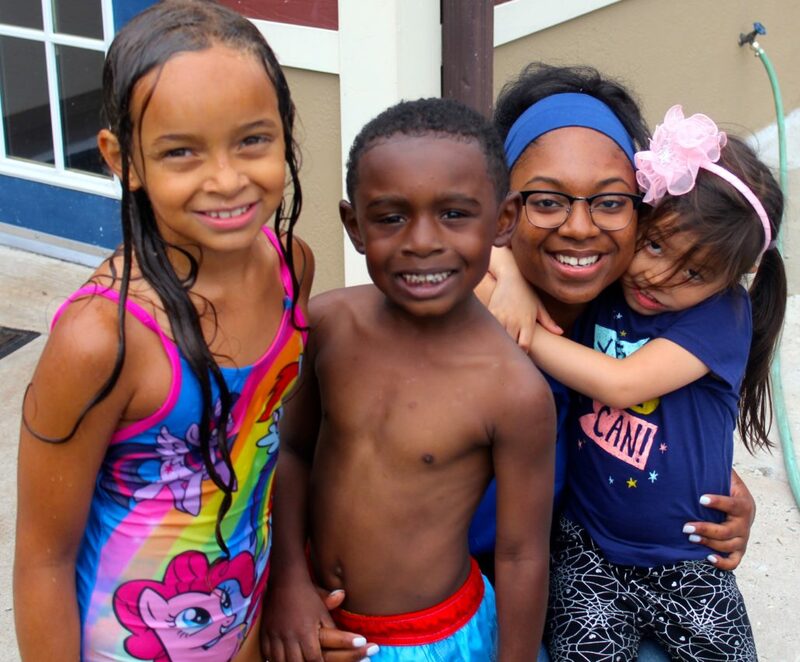 Week seven provided many fun avenues for campers to enjoy their time there and their friend. Some ways were the awesome field trips to Sahara Sam's and the NYC trip. Another fun activity during week seven was the tea party! All were invited. Boys and girls, dressed up or dressed down, the young and the old. Everyone had a blast with tea, cookies, and friends that produced laughter from the belly. It's exciting to see how week 8 will treat the campers of Cedar Brook. Going out with a bang, week 8 will bring new and exciting activities. How does that saying go? Time flies by when you are having fun. Cedar Brook Day Camp has been a blast and now we see time is saying good-bye. Week number 6 left quickly, as much as we tried to convince it to stay it wanted to go. But week 6 sure did leave us with a lot of fun memories. This week gave us Jersey day, the Funplex, cupcakes, a BBQ, and the Senior Sleep Over. Monday welcomed the week with Jersey Day. 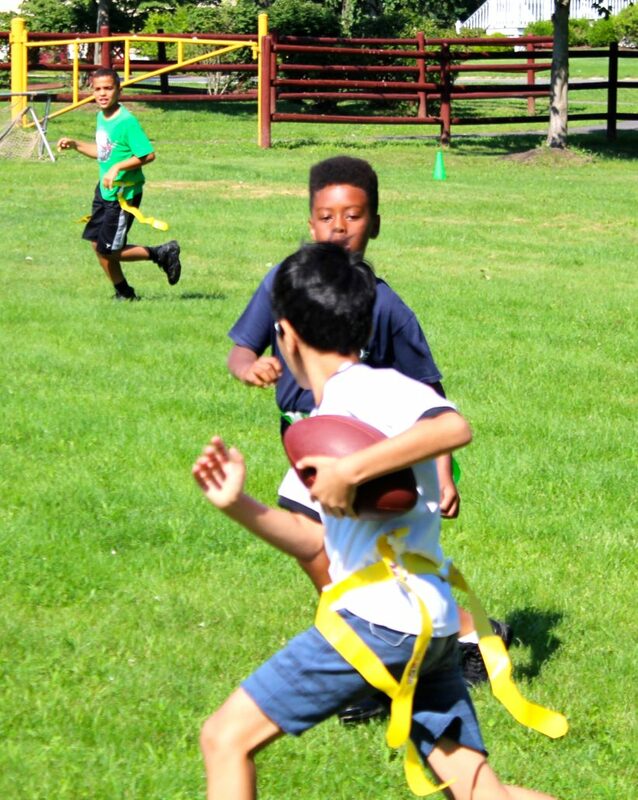 With the weather so nice, and the sky so blue came the perfect opportunity to get together a group of friends and have a friendly competition of flag football! Fast feet, swift hands, and a pig skin help bring friendship to a mother level. And of course what’s a beautiful day without a theme song, and so Ms. Jen the music teacher came to the rescue with her music class and camp was filled with singing voices. Camp is not just the great outdoors(although that is the major and best part), it is also the great indoors, especially when it comes to field trips! One of the best trips thus far was the Funplex. Arcades, and rides, laser tag, and the pool all bring in unison an amazing day of laughter and memories. Wednesday become the day where everyone showed off their creative side. From slime to cupcakes, there was something to be made. Camp is not just being outside and doing sports but also learning new things such as how to create the perfect dessert or how to mix the right ingredients for the stickiest, slimiest, stretchiest, goop ever created in the history of the world. What is one trip in one week compared to the joy of having two trips and in one week! 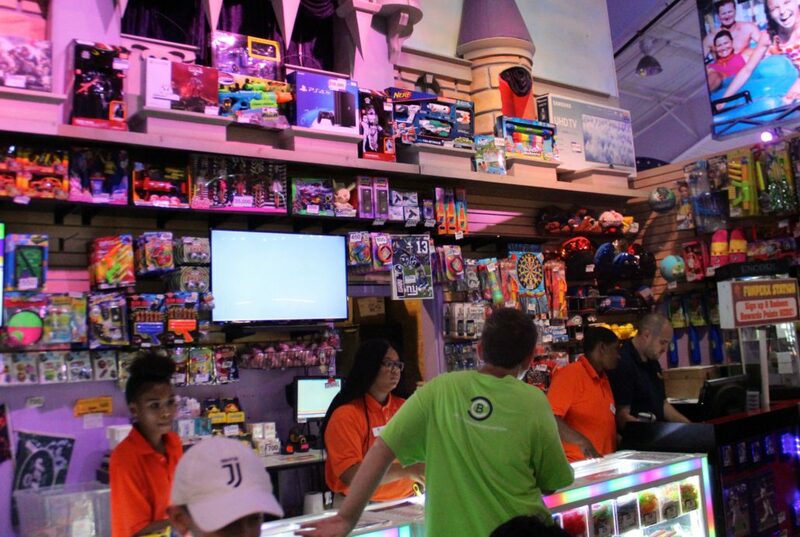 The Yestercades welcomed the campers of Cedar Brook Day Camp. With a comfortable home setting, and games galore, the kids enjoyed a healthy balance of outdoors and indoors, nature and technology. 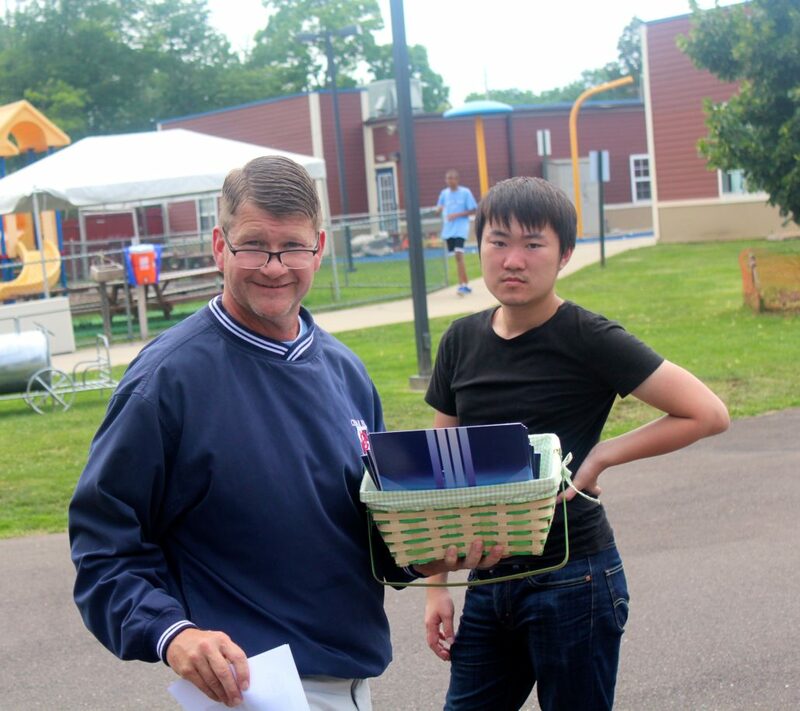 The parent BBQ also happened on Thursday. 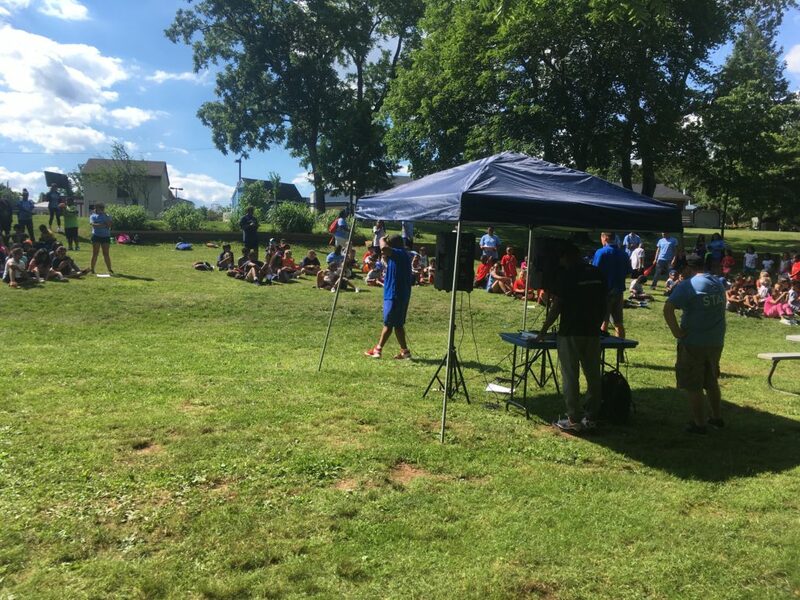 Although there was a slight drizzle at a point during the event it didn't stop us from having a blast as campers, counselors and parents enjoyed getting together as one to have the camp experience that the kids have everyday. With three amazing performances; Yik Yak, Chillin’ Like a Villain, and Crazy in Love, the parents received a rare inside live preview of the wonders that happens at Cedar Brook. With the sun rising from the East, the day started out like no other. Eyes wide open, smiles plastering the faces of campers as they wake up to the buzz that sings in the air. Jumping out of bed they prepare for the day that they have been waiting for all week, the Senior Sleepover. Friday goes on with all the best activities that any camp has to offer. 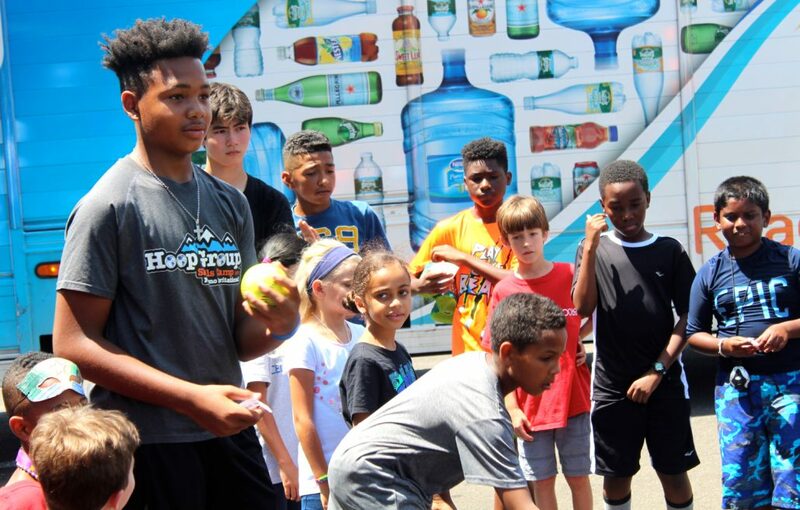 The splash park and pool, cooking and cupcakes, sports with professionals, archery like heroes, and more all the while in the back of their minds is “get ready for war”. The sleep over brings adrenaline to those who know that “The Hinger Games” game is more than just a picture. Only the biggest appetites win the eating contests. Those who dare to sleep feel the coolness of the pranks. Only Cedar Brook Day Camp does camp the way it should be. The halfway mark is officially over. Week #5 has come and gone. An 8 week camp is now entering week #6. This week gave us a more relaxed atmosphere as campers and counselors are in the grove. 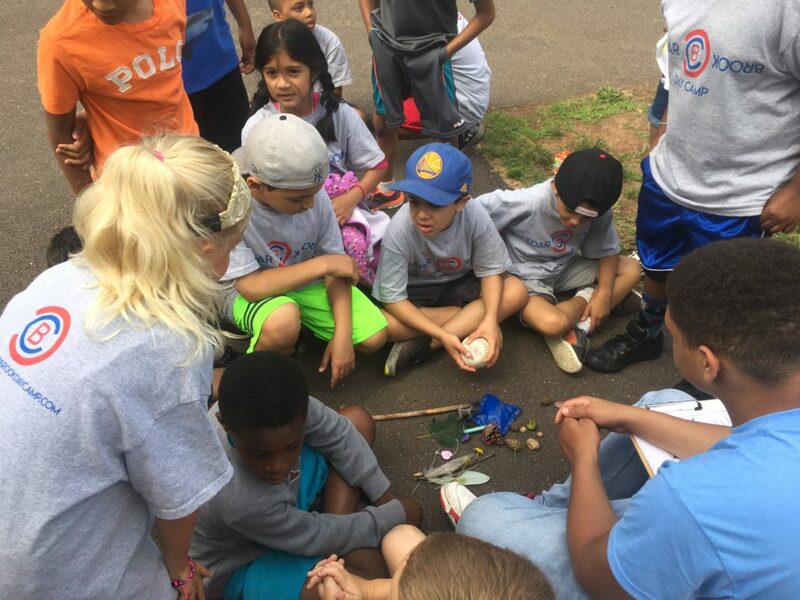 Going with the flow, and enjoying every moment that is presented allowed all people involved at Cedar Brook Day Camp to become fully immersed. With children and teens running around and learning new skills, knowing that camp is about to end makes the activities all the more fun and the days much more appreciated. 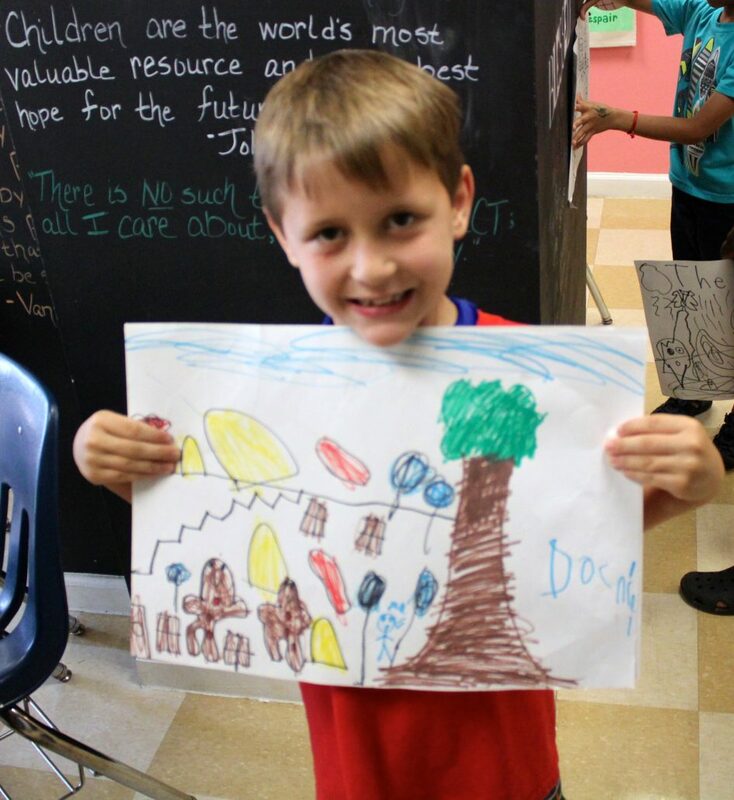 This week showed the campers the joy in taking time to become aware about others’ life and appreciate their’s. Monday, was wear pink for Breast Cancer Awareness. Camper and counselors came in wearing pink shirts, socks, and bandanas. On top of all that, the day consisted of the most artistic. 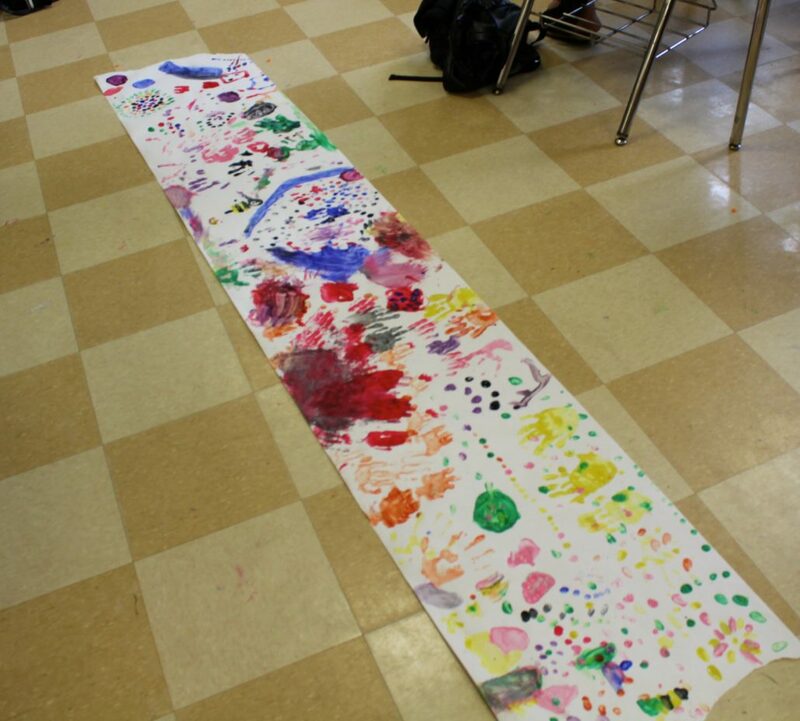 The campers were full of loom bracelets and necklaces, plus hand paintings. 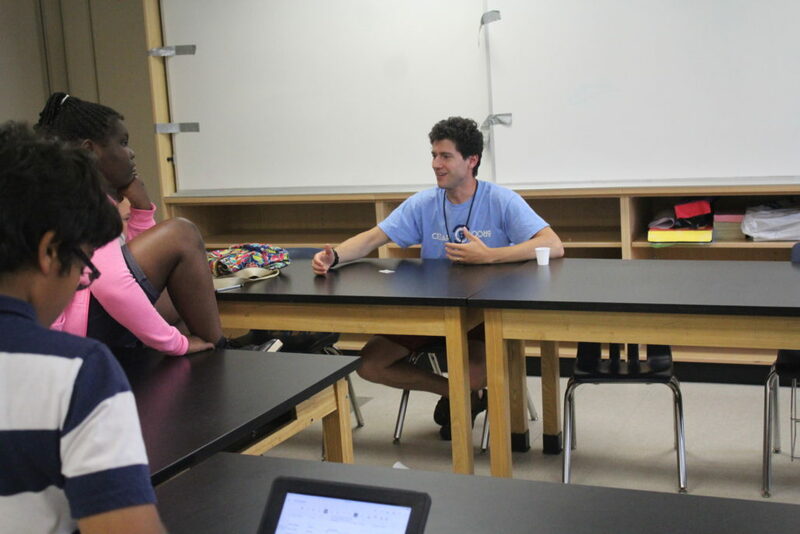 Tuesday continued the support by having the campers and counselors wear blue for Autism Awareness. 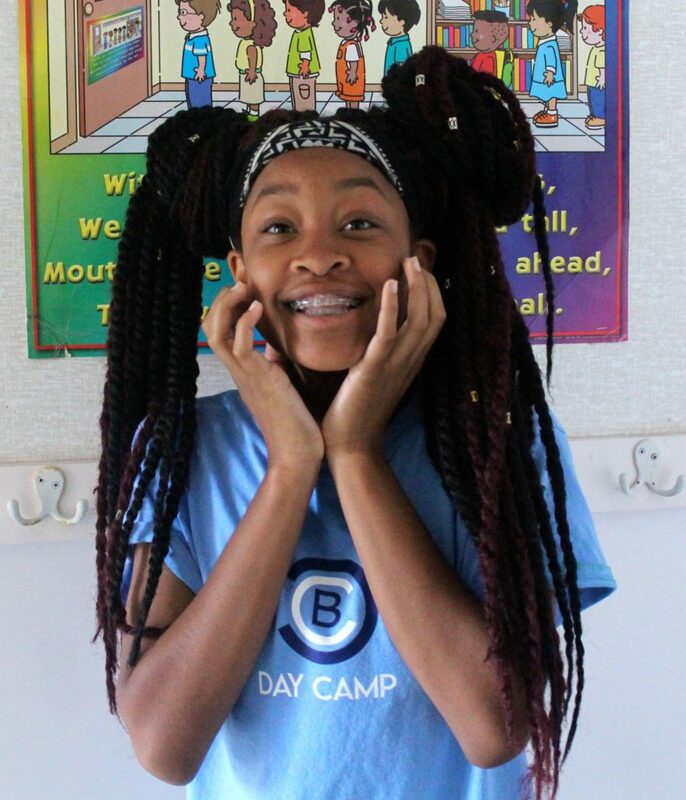 The camp was filled with all shades of blue, but it was only on the shirts in support of the awareness as the faces of the campers were in awe at the rocket that Mr. Q the science teacher had. The whole camp enjoyed shooting a rocket into the air that went quite a few feet up. They also enjoyed running after it as it parachuted down. No cloudy day was going to damper their joy. 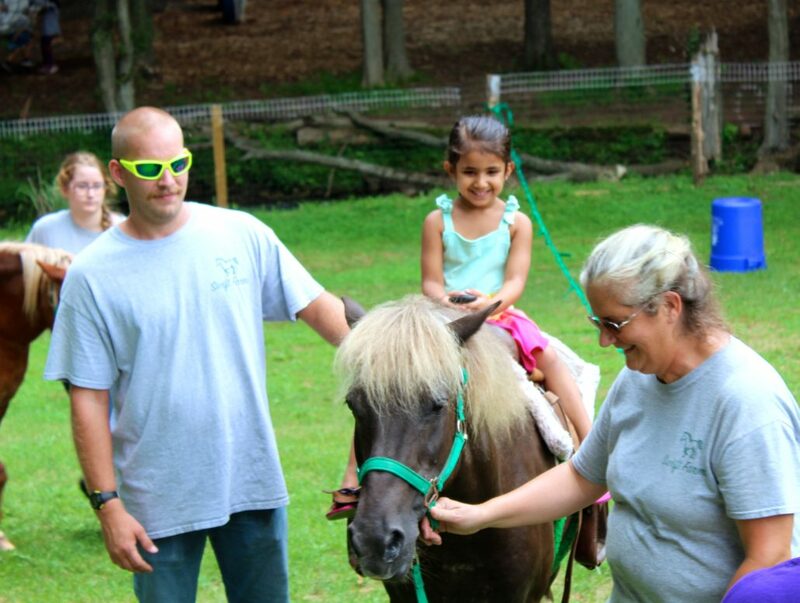 Wednesday was the New York City trip for the older kids and good old day of classic fun for the rest of the campers, with a little visit from two ponies! While the older kids got to see the beauty of Manhattan, the others enjoyed an intense game of dodge ball, ga-ga, and soccer. A little later on in the day, the youngest of them all received a welcoming surprise from two beautiful tame ponies that allowed the Pioneers and Adventurers to ride them. 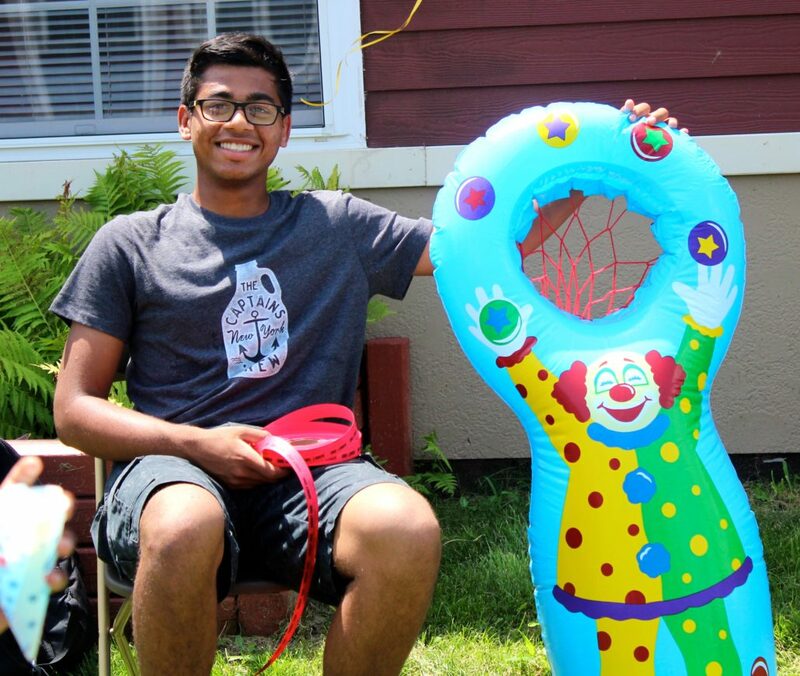 While camp activities are fun, it’s the bonding and friendships that made summer and camp the most memorable. The best way that happens s by being with one another and having fun in your own way. 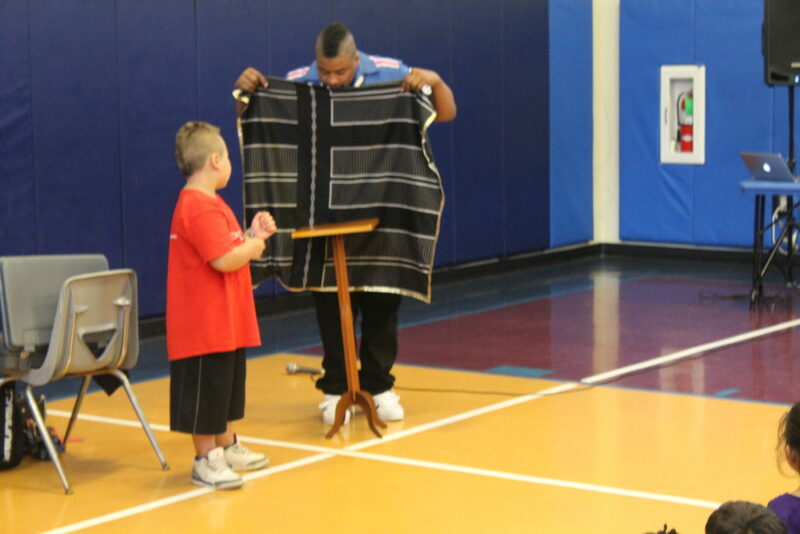 That is what Thursday presented to campers and counselors to their own and one another. There was such a love and friendship in the atmosphere of Cedar Brook that it had to captured. With camp electives running smoothly it has now come time where some of the campers are now taking over and showing off the skills they learned. It is exciting to see what week #6 has to offer. Week number 4. Monday through Friday has been seen; it came and went. This week was hot, on a roll, and just down right fun! La vida es un carnaval(name of a Celia Cruz song), but also the very theme for this week. This week presented us with Carnival Week. From animals to crazy colors, parties and pie, this week surely gave us some of the best in life. Monday opened up with one of the most popular and cuddliest of all events. 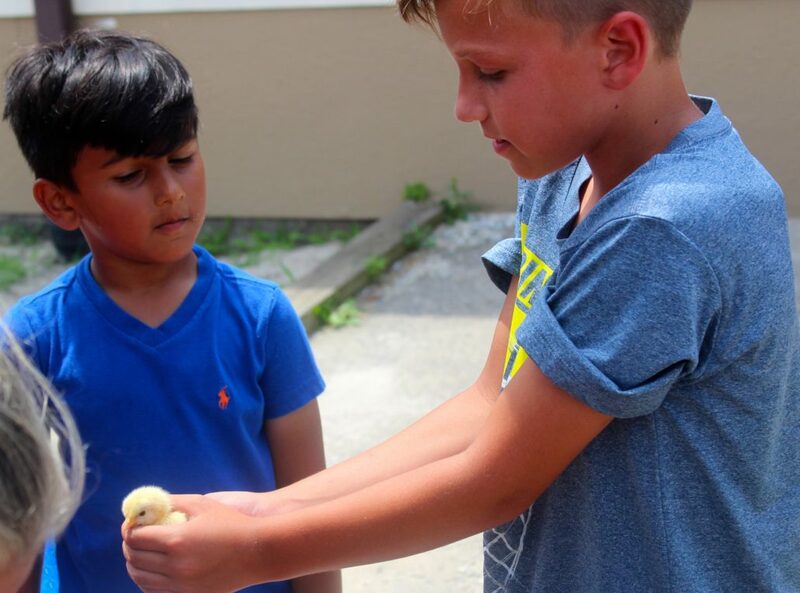 The petting zoo was a hit as campers and counselors enjoyed animals of all kinds that decided to visit from Swift Farms. The baby chicks and the miniature horse were the most popular. Everyone got a chance to hold the small bird that fit in the palm of their hands, and the small horse that was roughly the size of a 5th grader. The heatwave(and fun-wave) continued on Tuesday with the rollerskating trip. Round and round the campers went as they laced up the skates and rode around the rink with the feeling of gliding and soaring in their bones as the breeze from the movements blew through their hair. The kids enjoyed just riding around and putting on skate races. Surely there are future professional roller derby kids in our midst. Wednesday graced us with the most colorful of all days thus far with Tie-Dye day! From hues of red and green, to yellow and blue, the camp was filled with campers and counselors showing off camp spirit and friendly competition. The cabin with the highest percentage of tie-dye campers receives a Dunkin Donuts party and the counselor(as voted by the campers) with the best tie-dye won a breakfast of their choice. The day also included an exciting trip to Six Flags for grades 5-9. They enjoyed all of the perks that Six Flags has to offer; from thrilling rides to silly games and of course the best attractions at the toon town area. Thursday was a little more cautioned due to the heatwave alert, yet the fun still went on. All outdoor activities were given inside. Dance class was inside, ga-ga was held inside, and the Splash Park(well that was outside) definitely used and useful in the heat that could fry an egg. 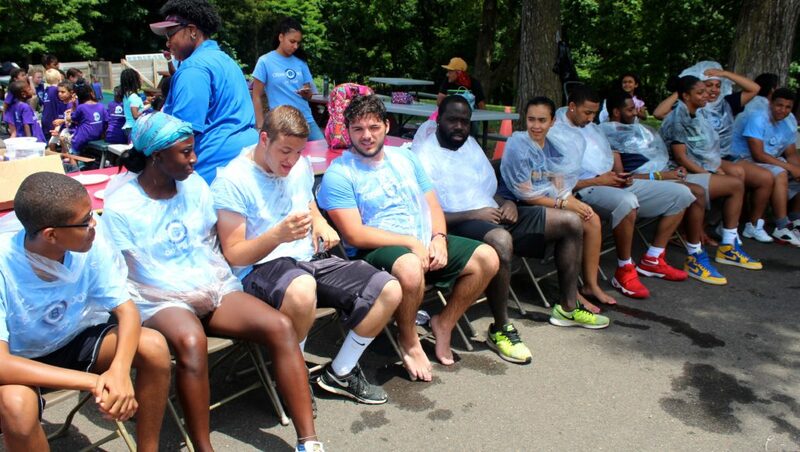 Yet through it all, the joys of summer camp at Cedar Brook Day Camp still remained in the eyes of the campers and the anticipation of Friday’s Carnival(and throwing pies at counselors) drove that excitement from beginning to end. A sunny day, with little to no clouds in the clear blue sky. A refreshing breeze moves in on the hot 93 degree temperature. 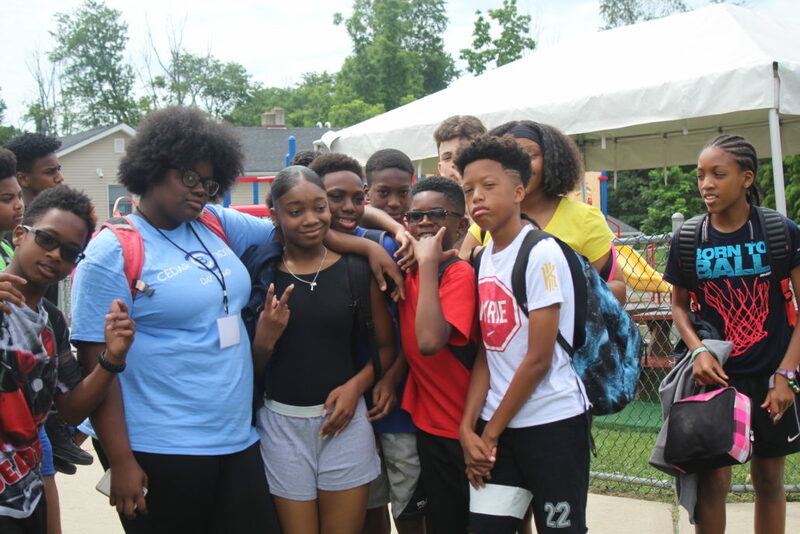 All the while Teen Quest, Explorers, Voyagers, Adventurers, and Pioneers are scattered about the camp making shots, dunking counselors, popping balloons, jumping in the bouncy house, taking a splash in the Splash Park and so much more during Cedar Brook’s Carnival Day! Smiles, laughter, jokes, and friendly competitive taunts are shown on the faces of every camper and counselor. Certainly the carnival is the highlight of the week. 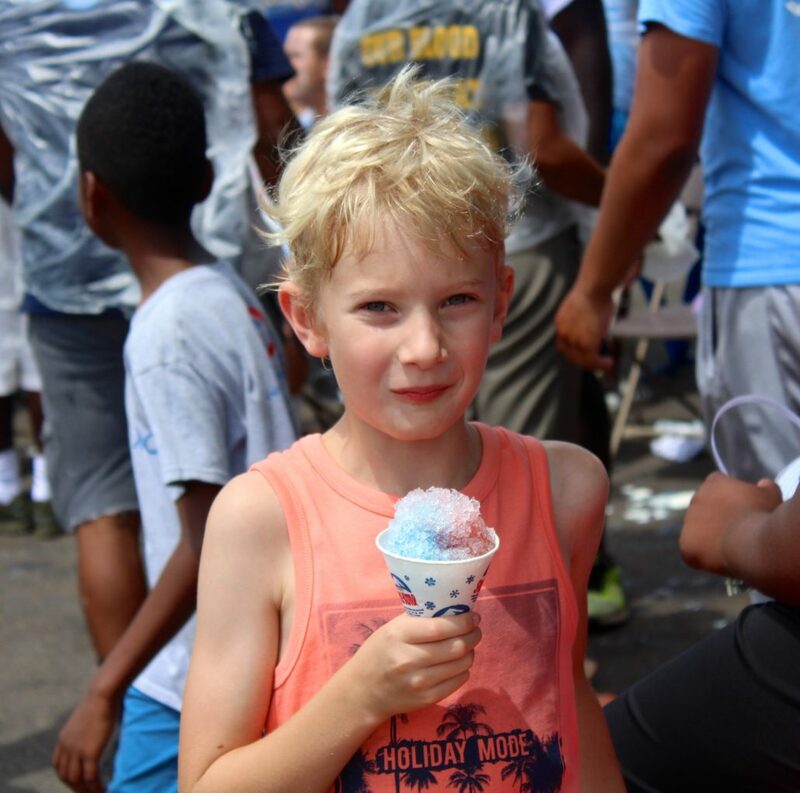 The joy was just contagious as kids and adults ate pizza, popcorn, cotton candy, and Italian ice’s. Wacky week 3 came and went. It was filled with activities, adventure, and awesomeness! Monday gave us Uncle Magic, and with him floating tables, white doves and a face of disbelief. 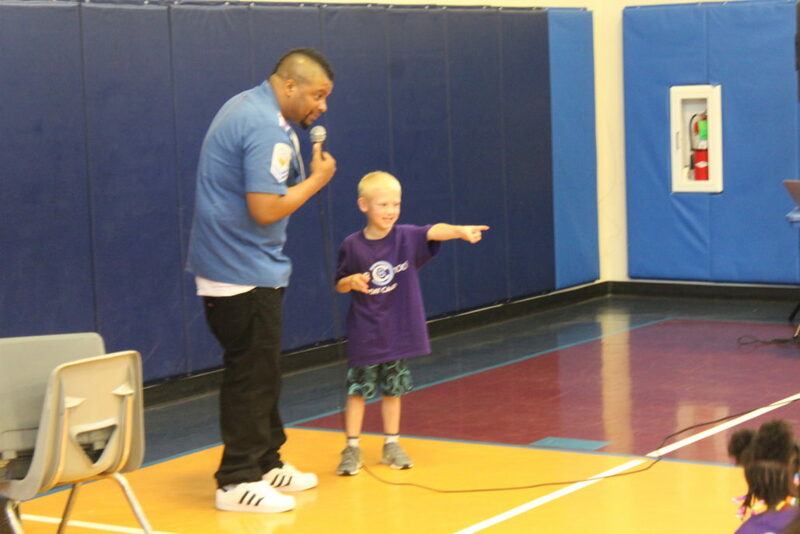 From the pioneers to teen quest, campers and counselors had a great time as Uncle Magic performed mind blowing tricks that got everyone on their feet. He even called on helpers from both sides. 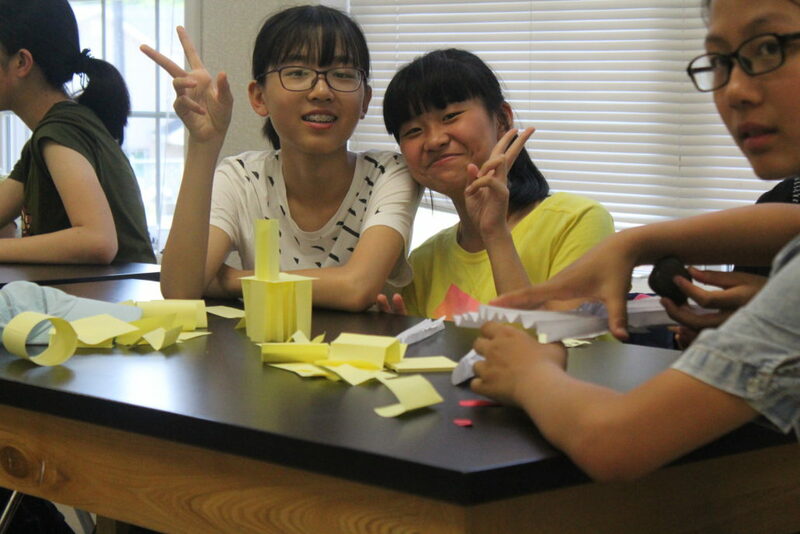 Monday(and the camp) also welcomed special friends from China. They and the regular campers had so much fun teaching and learning about each others culture. It was especially fun showing them all of our dances such as the Cha-Cha Slide and the Cotten Eyed Joe(which was their favorite). Tuesday, everyone became a unit as the whole camp(counselors included) went to the movies. What great timing too; watching a movie while it is raining is a great way to spend time together and bond even more. The movies were great! The younger kids enjoyed the hilarious film Despicable Me 3; they even continued to talk about it after leaving the theater and arriving at camp. The older kids sat on the edge of their seat with the action filled Marvel Comics movie Spiderman: Homecoming. Tuesday was a great day to get closer with our fellow campers and solidify friendships. Wednesday ended up being the wackiest of all the days(and the most fun) with it being crazy hair day. There were so many different styles of crazy hair. 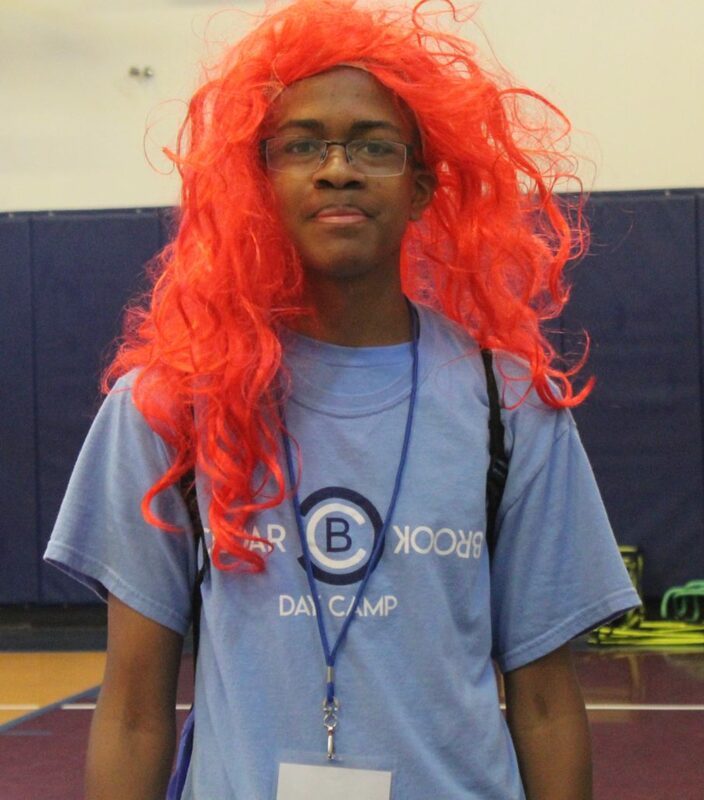 Campers and counselors participated and laughed at the silliness the day provided. Even our friends from China enjoyed the concept of getting crazy. It was such a great day, and a day that ended in ‘Until we see you again’ instead of ‘Goodbye’ as our new friends went back to China. Thursday was the most anticipated day as it was the trip to Dorney Park! There were many enthusiastic campers ready, and set, to get on the bus and ride to Pennsylvania to get on a roller coaster. They came back all content about the trip and excited about the next one. Friday was a wet one, but even then the sun is still out in the rain, just behind the clouds. And so, instead of letting the rain stop us camp went on with just as much fun as the other days, and weeks. New dance routines were created, basketball games were just as intense, and sometimes people even saw double! 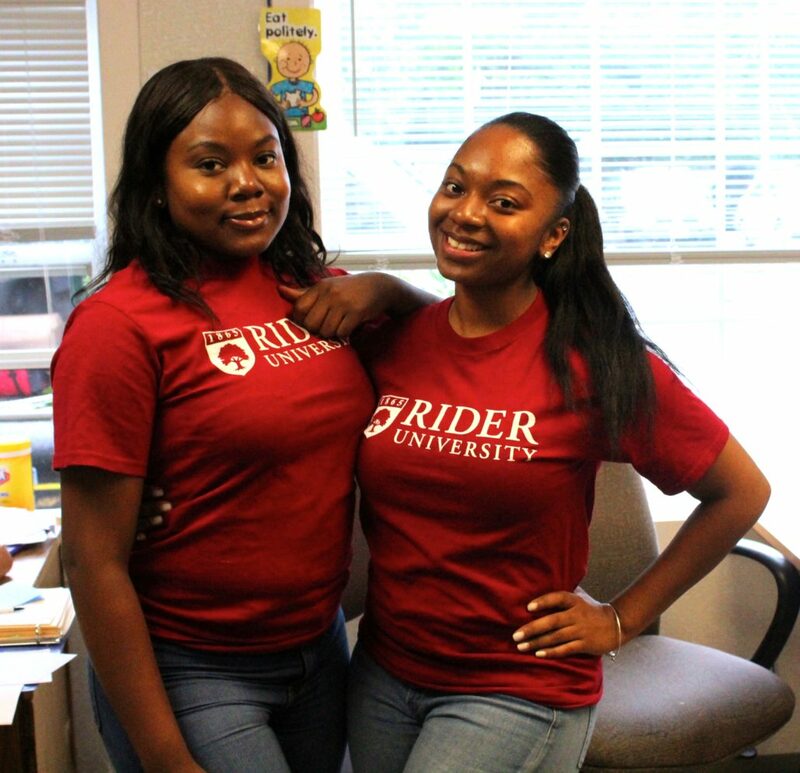 That’s right, Friday was also Twin Day. Campers and Counselors came in looking like twins. Not only that, it was also the highly sought, and waited for Senior Sleep over. With pranks, ‘Hunger Games’ type games, competitions, Man Hunt and so much more it was a night they won't soon forget. Week 3 was great and the weeks to come will get even better! Wednesday gave us a way to show off our inner creativity and craziness, with Crazy Hair Day! So many creative hair styles. Styles from Donut Buns, to Dyed Hair, and Floral Farms. There was so much laughter at the silliness of doing something different with our hair. Overall, everyone had a good time and even shared style secrets. On a nice, sunny, summer day such as Wednesday, it would be a shame to not go for a bike ride. Nope, not the engine roaring, helmet with flames type of bike ride; the kind with pedals and knee pads. 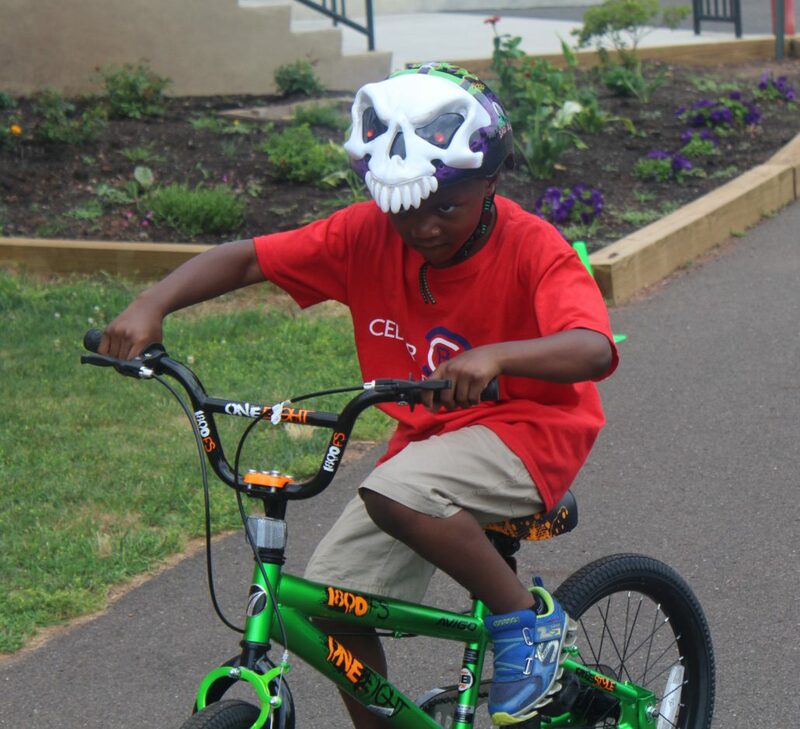 Thats right, the kids enjoyed the day with bike rides around the blacktop, some with training wheels and others daring to go pro. The day went smoothly, and everyone had smiles on their face, including our friends from China. They participated in everything. They saw Uncle Magic on Monday, went to the movies on Tuesday, and laughed along with us about the crazy hair on Wednesday. Sadly, Wednesday was also their last day. They ended their stay here with camper and counselors saying ‘I love you’ in Chinese. Everyone learned a little something with this experience. The kids are Savant and were Benevolent(Words of the Days), to our guests. Overall, Wacky Week has been a blast so far! The rest of the week should be just as amazing. Coming up is Twin Day and the Senior Sleep Over, and it will surely be filled with wackiness and silliness. The first day of week 3 came and went, and provided a bounty of joy, fun, and laughter. 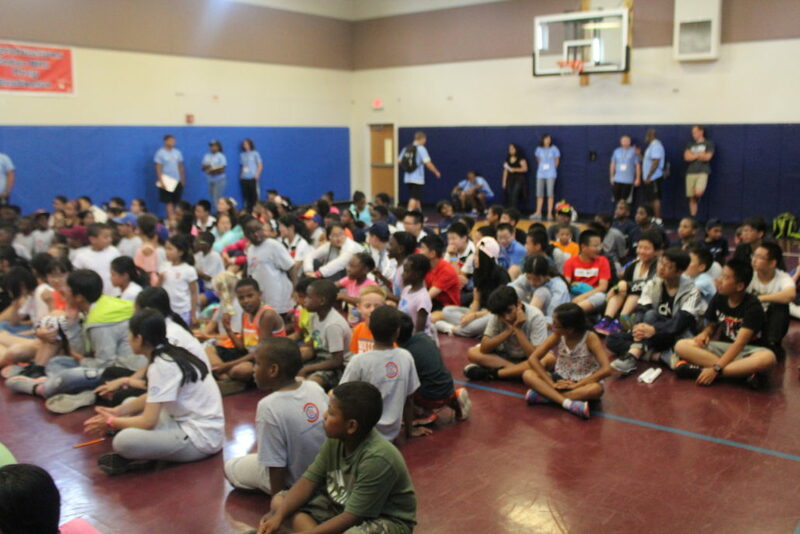 Cedar Brook Day Camp welcomes special guests from China! The same day provided a monumental mystical magic man called Uncle Magic! The day started out with everyone ready to party, and so campers and counselors moved their fast feet to the music. After doing their morning warm up, they sang Happy Birthday to all birthday's for that day. Then everyone was introduced to our special guests from China. 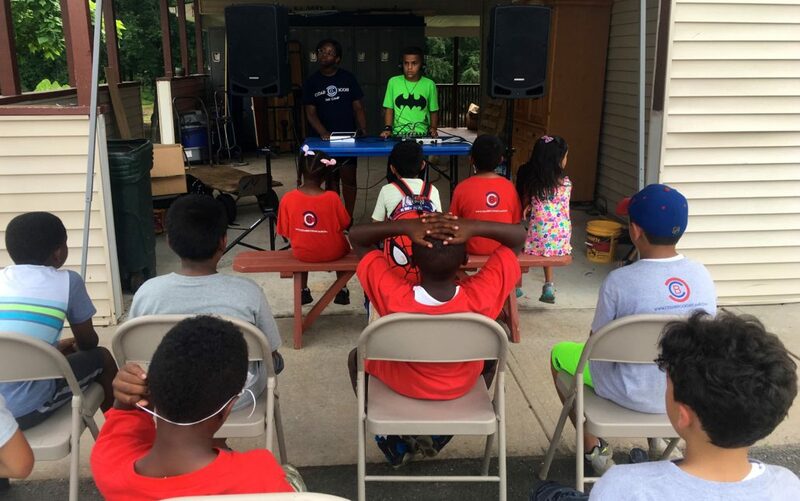 With the Word of the Day given, and their blood flowing all campers were ready to continue their day filled with activated and electives. Later in the day Uncle Magic came and wowed the campers and counselors with disappearing tricks, floating tables, and doves. All of these magical moments, while rocking out to instrumental hip-hop and making the kids and adults part of the show. At the end of the day everyone gathered in the front lawn and rocked out to line dance music. When we ASSAY(word of the day), or analyze, the day, all went well and everyone excited about the rest of the week. 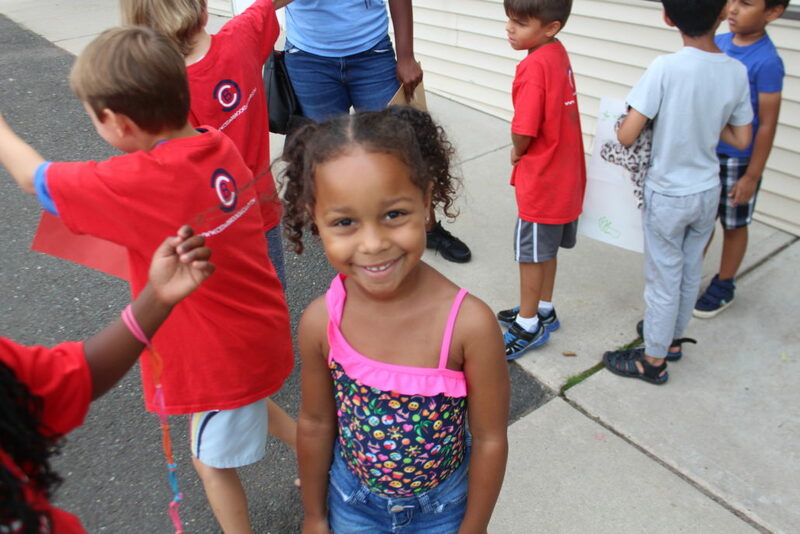 Week 2 of Cedar Brook Day Camp is over and week 3 is about to begin. Week 2 was a blast just as predicted. Monday presented a wave of exuberance(word of the day) that burned within all present. It all patriotic with a sea of Red, White, and Blue. All in preparation for 4 of July on Tuesday, also when camp was closed for families to spend time together. Wednesday welcomed us with another fun trip in our schedule to the Turtle Back Zoo! The younger ones enjoyed seeing the vast diversity of animals. From A to W(sorry, no Z’s), the kids saw Alligators to Wolves. There was so much to do and see. Between the Prehistoric playground to the different exhibits, the campers were offered a day full of fun and adventure. The older ones got to enjoy a grander version of our rope adventure course with the zoo’s Treetop Adventure Course. It offered an Aerial Obstacle Course, and a Zip Line! 30 unique challenge elements with an average run time of an hour to an hour and a half. Thursday taught that preparation is key. We prepared for rain and yet when it didn't we still got to enjoy the great outdoors. With field sports introduced, campers got to enjoy a rowdy game of campers vs. counselors at kickball. 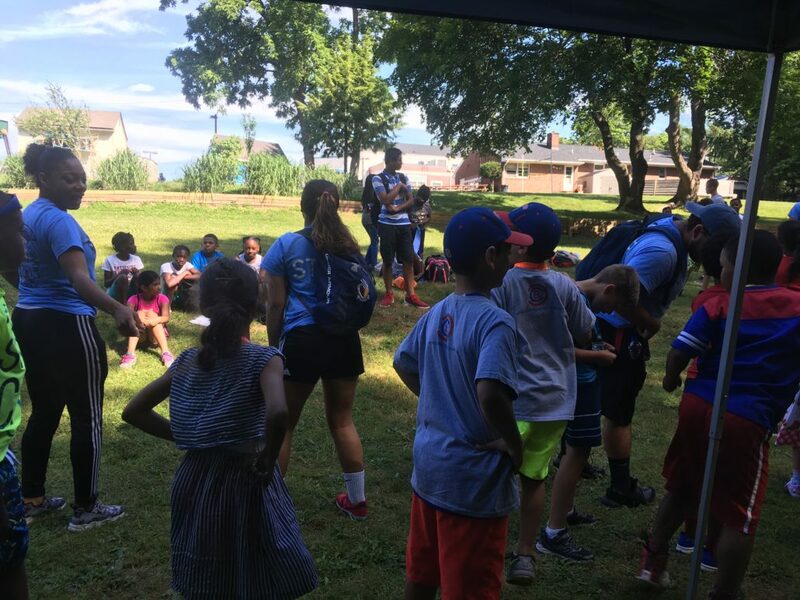 Cedar Brook sure does have a lot of star athletes(and I’m talking about the campers!) Mr. Q took the kids on an adventure within the brook and the kids took pleasure in discovering the natural beauty and fun in being outside. The kids also got to experience canoeing! And what’s a fun day without music and dancing? The campers learned new dances, and even enjoyed a hyped up game of freeze dance and musical chairs. Thursday also made room to prepare for Friday’s Olympics. The campers and counselors crated a banner, a song, and chant for their team. Thursday was filled with such camp spirit! Thursday’s practice with preparation, produced fruit for Friday, when it actually did rain. Therefore, instead of the Camp Olympics(which will happen at some point in the very near future) the campers enjoyed and Indoor Fun Day. There were two Theaters(Movie Rooms), Mr. Q showed how to make the perfect paper Air Planes and then held Plane Races. There was an improv book reading for the younger ones. They had to act out the story that they were reading, and had dance parties between the cabins. The game room brought us back to Uno and CandyLand, all the while enjoying the company of each other. The rain also provided extra time for the groups to prepare their chant, song, and banner. When the Olympics come it is sure to better than ever before. If weeks 1 and 2 were any indication, then week 3 is going to be phenomenal. Week 3 is Way week, and an opportunity for all to get silly and crazy with laughter and fun. Monday kickstarts the week with magic from Uncle Magic, and two trips! One on Tuesday, everyone heads to the Movies and another on Thursday to Dorney Park. And in-between is crazy sock day and crazy hair day! This camp surely is filled with exuberance. Friday, June 30, 2017, spirit day at Cedar Brook Day Camp marked the last day of the best first week ever. The kids had a blast! All campers and counselors gathered on The Hill for morning announcements and preparation. With a sea of blue and gold covering The Hill, campers excitedly got ready for the day. First, they celebrated three birthday’s with the birthday cha-cha song and a big round of applause. In the spirit of Spirit Day the campers showed off their dancing skills with The Chicken Dance and the Cha-Cha Slide. They even got the counselors and teachers to dance along with them! What a great way to start the morning. Then came the word of the day. The kids learned the word Fidelity. It is the state of being faithful or loyal. After all that, the campers enjoyed their day with activities and electives. There was a great rely race that had everyone buzzing with excitement before and after. Mr. A showed them how to shoot a bow and arrow like the greta comic book heroes Hawkeye and Green Arrow. Ms.Jen taught them how to write a song about a magical forest and ice cream. 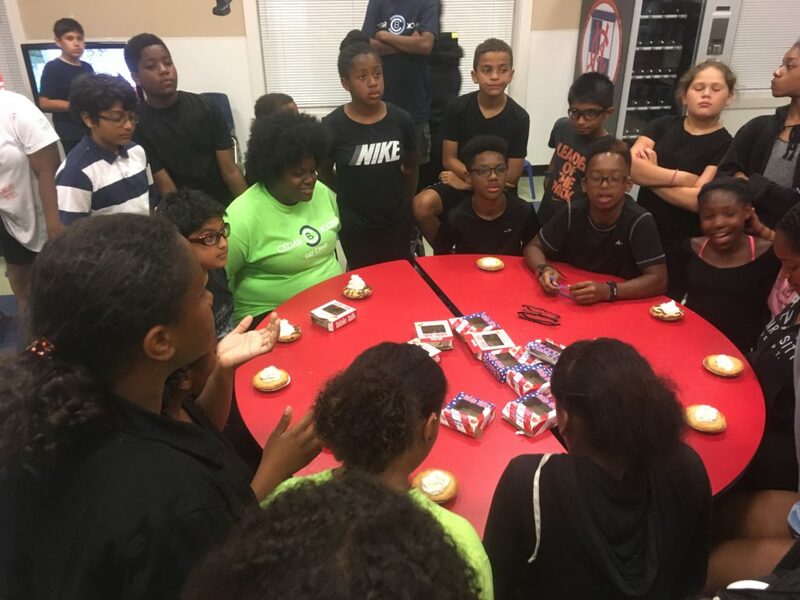 The campers also had fun with Mr. Q, who showed them how to make a bottle rocket with a few drop of rubbing alcohol, oxygen and a lighter. 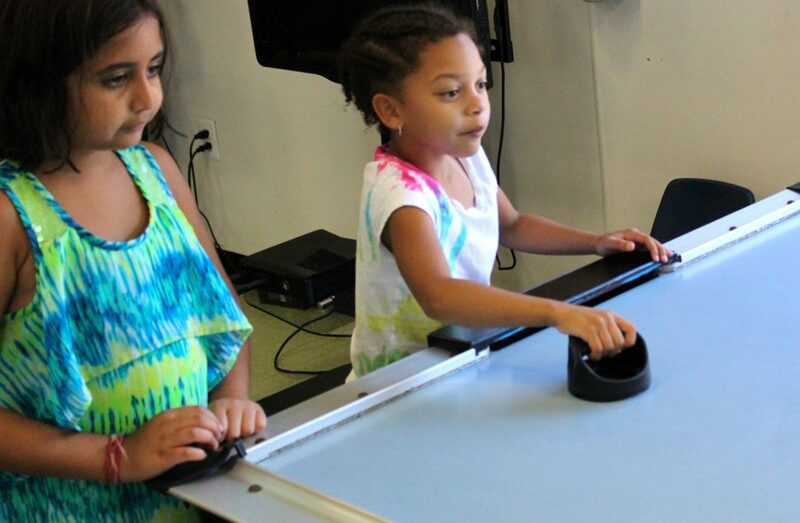 These are just a few of the many fun activities that the kids enjoyed. With week one down and fun to last a summer, week two looks just a promising. Week two is Olympic week, offering another trip, the parent BBQ and Olympic Day it looks to be just as fun as the first week! In honor of Independence Day, Monday, July 3, the camp will be wearing Red, White & Blue. Your goal should be just out of reach but never out of sight. Day two of Cedar Brook Day Camp only got better! With the campers excited for the new day and the counselors ready to show off their inner kid; kids, teens and adults had a blast. The day started off with everyone on the lush green hill for morning announcement and our signature cheer. Not only were the kids involved but the staff as well! Then the day continued with intense games of basketball and ga ga. Day two also featured new electives and activities for the campers; swimming and radio. Campers were able to show off their olympic swimming skills. They also took control of the station, taking charge of informing everyone about the trips and events to come. The coolest part of the day was going on an adventure in mother nature. The scavenger hunt opened up new wonders for all to discover. The brook also provided a plethora of life to find and examine. 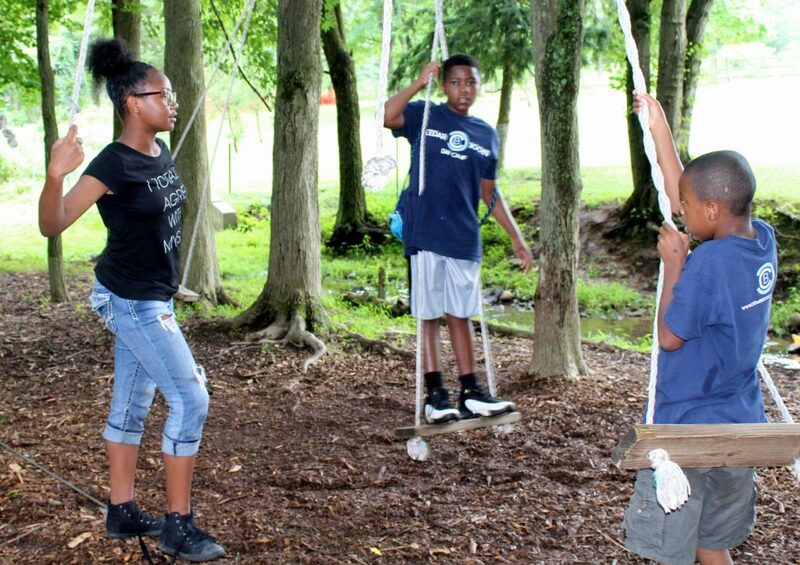 Cedar Brook Day Camp continuously provides new adventures and learning experiences that are all wrapped in fun for campers and counselors alike. 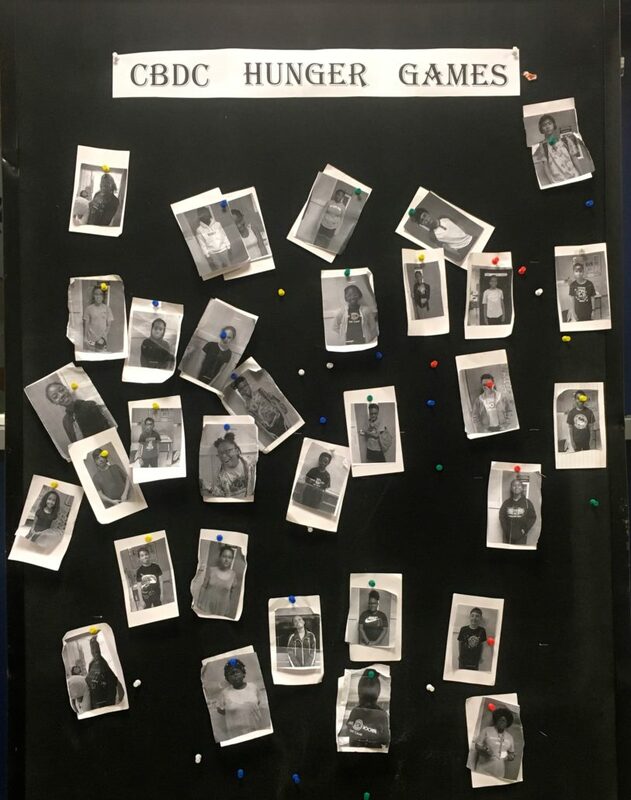 What’s so great is that adventure is not only limited to the boarders of Cedar Brook Day Camp, but expands to other places such as New York City! June 28, grades 5-9 will be able to explore Times Square. The NY trip will be from 9am to 5:30pm with registration still open for the morning of June 28. The trip will potentially consist of stops at Rockefeller, Apple Store, Central Park South, the M&M Store, the Hershey Store, and Public Library. For lunch, what better way to embrace NY than with their famous NY Pizza! 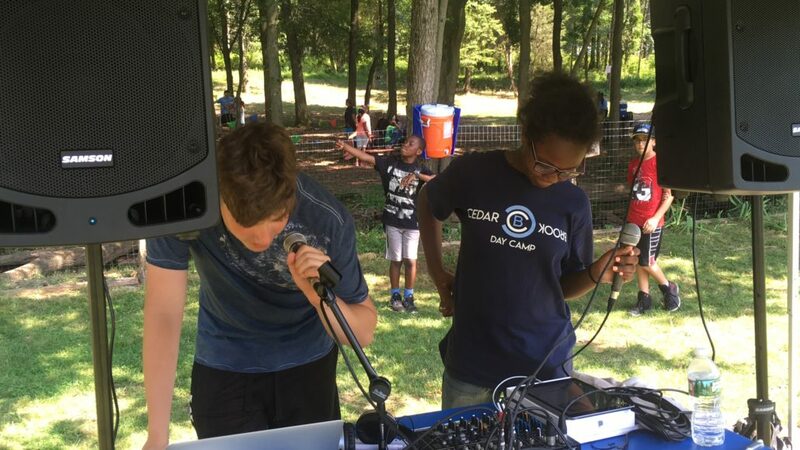 With camp deep in the fun zone, it’s no wonder Cedar Brook Day Camp truly is how camp should be. Day one of Cedar Brook Day Camp, has come and was filled with much activity. The day started on our lush green hill, with all people part of the camp gathered together. At the hill, camp announcements were given and a variety of catchy clean music was played. 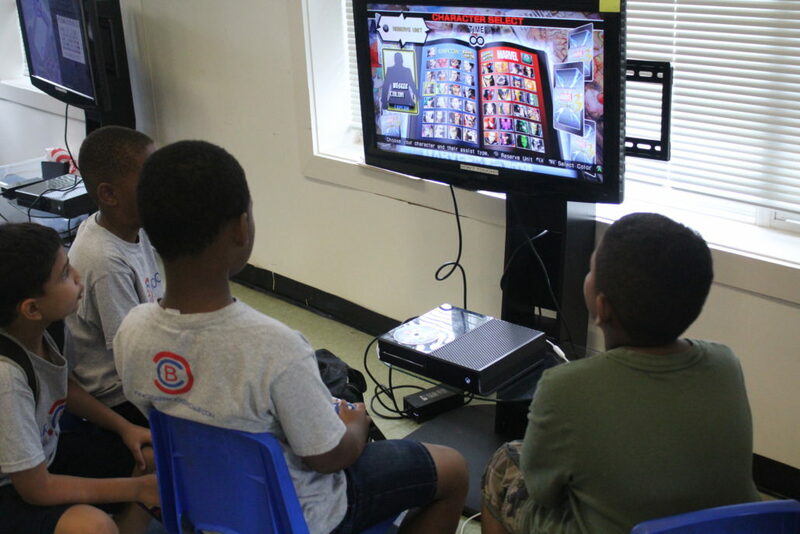 Throughout the day, campers and counselors participated in a numerous amount of activities. These consisted of archery, the rope course, music, and video games. 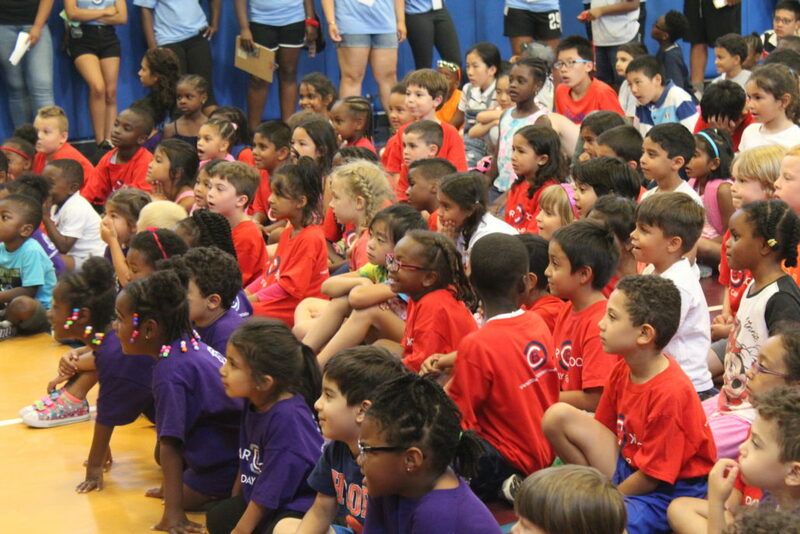 The day also offered many friendly competitive games such as of basketball, kickball, ga ga, soccer, and a few races. One of the highlights of the day was when all group divisions gathered once again on the hill for Cedar Brook’s Best Cheer Crew. Each group preformed a cheer representing the spirit of Cedar Brook. With campers buzzing with excitement and counselors cheering on, the competition started. From chants, to songs, to dances, the competition had everything. Only the best of the best at Cedar Brook. What a great way to start the week, with highly energized camp spirit! The rest of the week looks to continue the greatness that started today. Tuesday will be a scavenger hunt; Wednesday there will be an ice cream social and trip to NY; Thursday is the day everyone is at Crystal Springs; and Friday everyone shows up wearing the camp spirit, donning the signature Blue and Gold colors. It truly is, Summer Camp the Way it Should Be! The lunch menu for the 1st 4 weeks is now online. Please check for some of the meals planned for your child online. Monday, June 12, 2017, at 7pm began Cedar Brook Day Camp’s open house. This was the first event indicating the start of the camp’s summer 2017 year. The meeting spoke of great plans and promises for kids and parents. 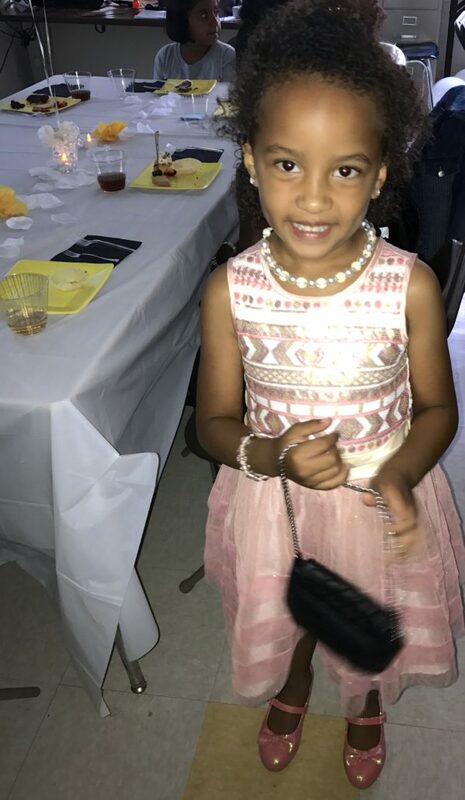 The grand outcome of open house inquirers, and the fun atmosphere from beginning to end, was a small view into a larger picture of the many friends the kids will make and the enjoyment both parents and children alike will encounter. 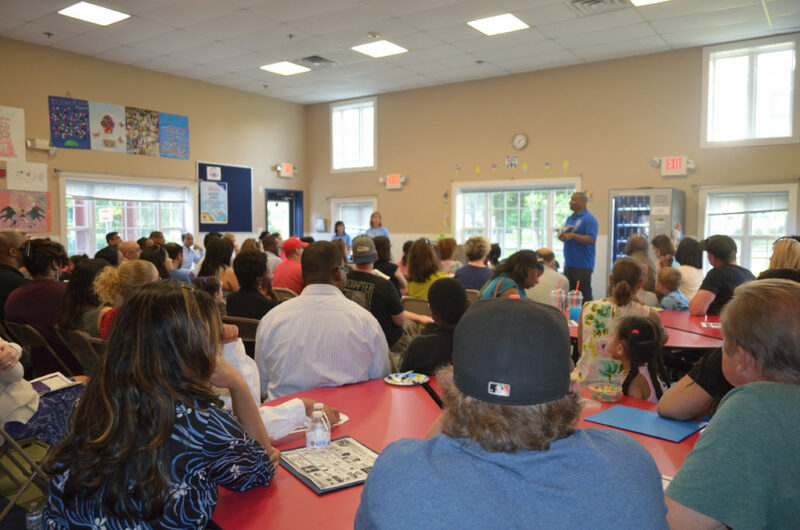 The meeting held true to its promise of covering all topics surrounding the camp, leaving parents secure about their decision to send their kids to the camp. All questions were answered and enthusiasm followed them out the door. Parents learned about the importance of relying on CampMinder. CampMinder will be the go-to parent portal for all things relating to their kids and the camp. CampMinder will include access to family information, forms and documents, health history, elective list, payments and invoices for tax purposes. It was highly stressed that all parents become accustomed to the daily use of CampMinder. This will be especially important when picking out the elective for the kids on a weekly basis. The camp schedule and hours of camp events was also discussed in generalized terms as the full schedule and completed guide will soon be available for all. 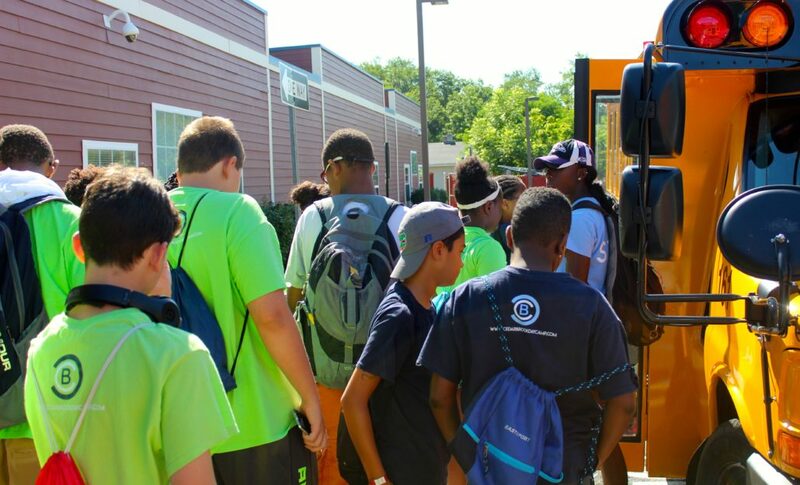 Transportation was also a topic of interest as a new door-to-door bus transportation service is available for all campers. This new transportation service caters to families throughout Somerset, and Middlesex County (though not all of Middlesex County will be covered). Before and after care was extensively spoken about. Regular drop off time is between 8:30AM and 9:00AM, with camp activities beginning at 9:00AM. Pick up will be between 4:00PM and 4:30PM. However, there is an option for before and after care with any combination of the parents choice. Before care allows parents to drop off their kids the earliest at 7:00AM and pick up their kids the latest at 6:30PM. The camp also promised the parents that all children participating in the camp will receive lunch. 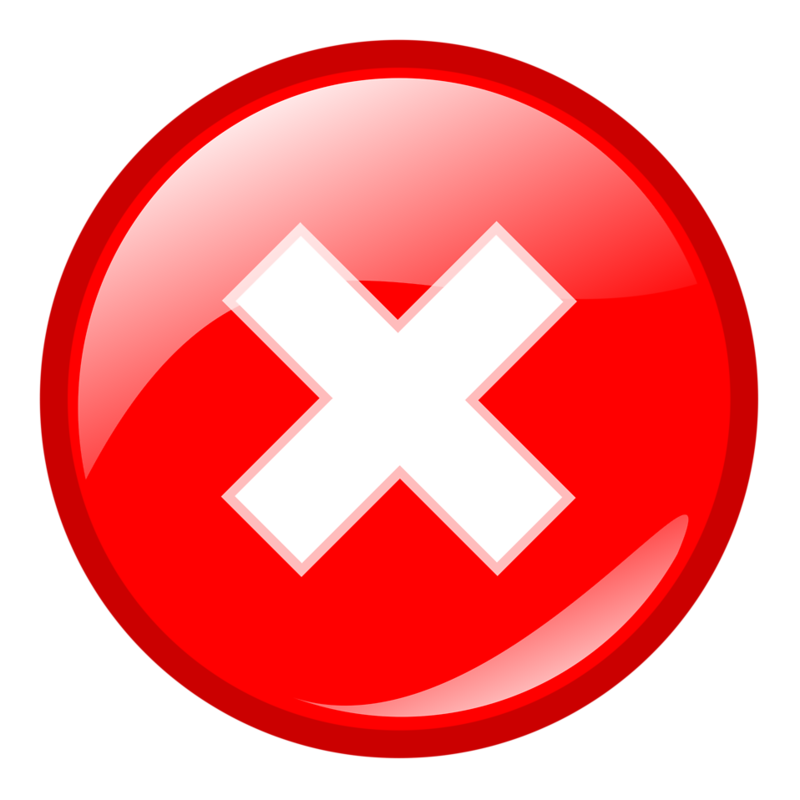 Although lunch will be an additional fee, and parents have the choice to opt out, if their child does not have lunch for the day they will still be fed. This came with the warning that though the child will be fed a charge will be placed on their account. There was so much discussed. Some other topics were the special events calendar, the freedom of choice elective program, and disciplinary procedures. As a special treat, they also heard from a small group of counselors and the elective/activity they will be teaching, giving a short account of what the class will be about. With the parents happily satisfied about all the will be offered to their children, the night ended on a high note. The final minutes were dedicated to the camp shirts, a final reminder to constantly be on alert on CampMinder, and that a full schedule and completed guide will soon be available for all. A time to mingle and learn, and see what is offered and who is offering it! On Monday, June 12, 2017, Cedar Brook Day Camp welcomes you to our open house. The opportunity to get an inside scoop about all things summer camp will happen at 152 Cedar Grove Lane, Somerset, NJ 08873 at 7pm. Best of all, a Q&A will take place to answer any and all questions you may have. Get a notebook ready with burning questions, and bring it to the staff. Feel free to voice any concerns and we will put you at ease with the secure, fun and learning experiences your kids will be having. We want to leave with all the knowledge you can get. So, come on down to Cedar Brook Day Camp’s Open House!